SoftPlanet makes it possible for everyone to get free F-PROT Antivirus download directly from our servers. There is no registration needed for downloading. Today's world is full of computers and they tend to become more and more. This, of course, has consequences – millions of computers become subjects of virus and hacker attacks due to the sheer number of them and the growing consequences. These facts have prompted the rise of anti-virus software, which is special programs that detect and eliminate malicious software from your PC. 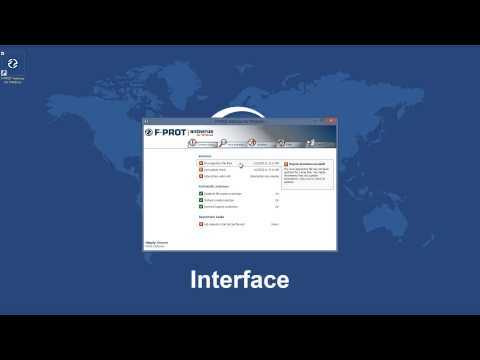 F-PROT is one such program – it has been around for quite some time and actually holds a few titles here and there. For example it is one of the oldest anti-virus programs in the world being created in 1989. It is also the world's first anti-virus product with a heuristic engine. All this, plus the extensive popularity of this software and the good maintenance make it a preferred software program. 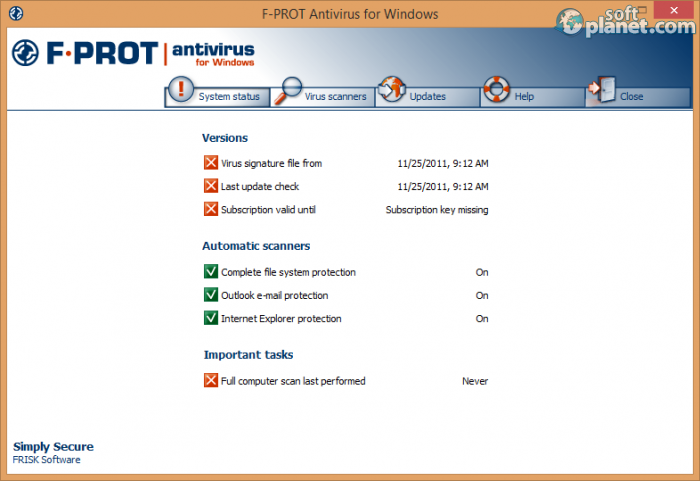 F-PROT Antivirus 6.0.9.6 has definitely been created with the end user in mind. Since the creators of this anti-virus tool have assumed you already have a problem with your PC they have tried to make this program as easy to use as possible. 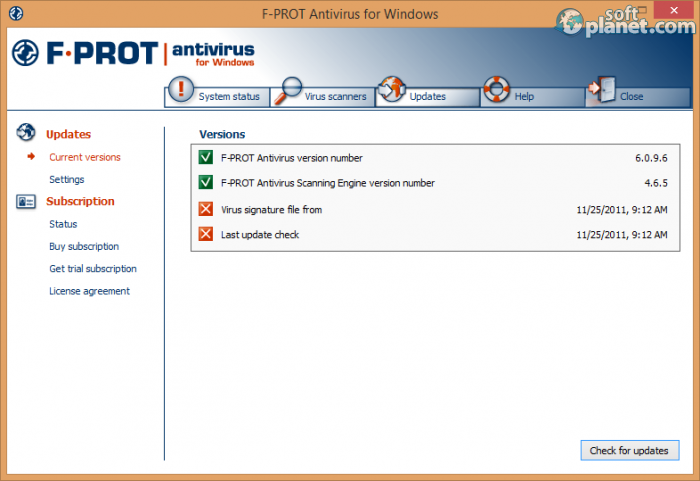 This is why F-PROT Antivirus 6.0.9.6 is small-sized and easy to install as it will not take you more than a few minutes to get this tool on your hard drive. When you run it you will also realize that the application is fast and comes with a simple interface too – and all these are nice prerequisites for have a nicely running PC in no time. The interface of F-PROT Antivirus 6.0.9.6 is one of its strongest points. It has many functions but at the same time it does not bury you in information that you don't need. The app runs in a relatively small program window that cannot be expanded or shrunk and offers five tabs to you. Each one of them opens a menu that will present you with additional functions. Of course all tabs and functions are related to virus removal so you can check the current status of your system, update the virus definitions, scan and eliminate viruses, search for help and more. There isn't much else to say about this software product as it has been designed to be straight to the point, which is always nice. F-PROT Antivirus 6.0.9.6 works like any other anti-virus program out there so quite naturally the first thing that you must do is update the virus definitions the app comes with. It is not hard to do but you won't be able to do so if you don't have a subscription key, which you can obtain during the program installation. Let's assume you have one and you have updated your virus definitions. Then check the system status and if you feel like doing it then scan your PC for viruses and other malicious software. It will take a while depending on how many files you have and where they are located. 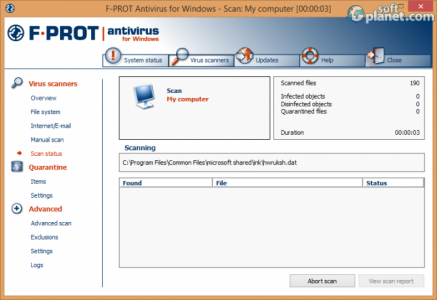 If you need a good anti-virus program then you should take a look at F-PROT Antivirus 6.0.9.6. This is a small-sized, easy to use, fast and simple software tool that promises that it will take care of the malicious software that resides on your computer. The two complaints that we have about it is that it is paid and then you need a subscription key in order to update the virus definitions even for the demo version but all in all F-PROT Antivirus 6.0.9.6 is a nice program that you should take a look at, especially if you have viruses. 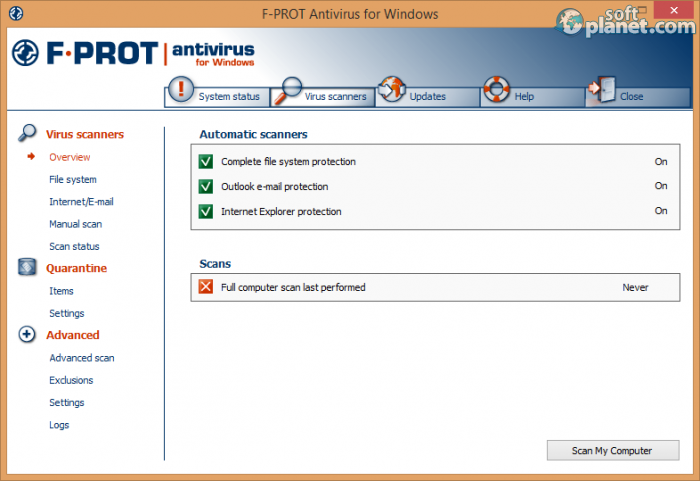 Our security scan shows that F-PROT Antivirus is clean from viruses. The current version of F-PROT Antivirus has been scanned by our system, which contains 46 different anti-virus algorithms. That ensures that F-PROT Antivirus 6.0.9.6 is 100% safe for your computer.